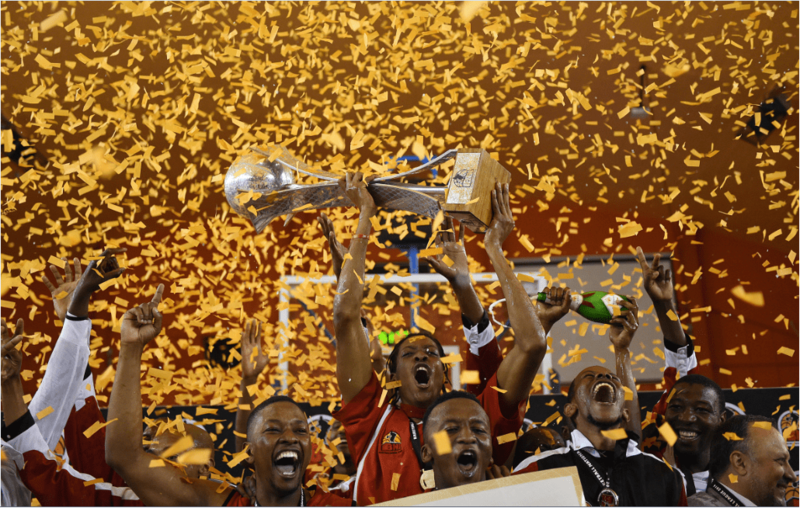 The sophomore season of the Basketball National League has been a great testament that basketball is indeed taking its place in professional sports in South Africa. Wembley Arena has been a great home for the league and big credit should go out to the Department of Sports and Recreation for their hand in having the infrastructure upgraded to accommodate the game accordingly. Having started with 11 teams in 2013, we had a great addition to the league when Duzi Royals was founded and took their place as the 12th team. The Royals did not just add to the numbers, they also added to the excitement in the league, boasting some of the best players to come out of Kwazulu Natal as well as 2 young American players in Corey Stern and Larry Jackson jnr. The champions Tshwane Suns also came back stronger and looked good to defend their title with players continuing to show great chemistry on and off the court. They were dealt a blow when their captain and leading scorer, Neo Mothiba, got injured and had to miss a number of weeks in the season. This did not deter the Suns though, as their defensive prowess continued to be their biggest weapon against their opponents while Dumisani Moyo and Allen Danga carried the bulk of their scoring. Captain Lesego Molebatsi has done well to lead the Egoli Magic this season. This follows a rather disappointing 2013 season where they could not make it into the top 4 teams in the league. Veterans such as Cedric Kalombo and Sifiso Ngcobo continued to stamp their authority in their respective positions, while the return of swingman Joseph Mazibuko was also a big addition for them. The Soweto Panthers made some adjustments in the offseason when they brought in the services of youngsters Lebesa Selepe, Mike Mukumbuta and Reece Prinsloo. The 3 became a big part of their success, with veteran Mboshi Bonunu and the likes of Jonathan van der Bijl also contributing big to their success. Credit must also go to Coach Michele Katalay, who took over the reins and immediately turned the team’s early season mixed fortunes around. These were the 4 teams that went on to qualify for the knockout stages and brought the season to a cracker of a finish. Apart from that, we saw very great reasons to celebrate the 2014 season from other teams and players who showed vast improvements.Teams such as the North West Eagles and Western Cape Mountaineers deserve commendation for their performance this season. There were also individual players who continue to put their hands up when it comes to leading their teams on the floor; players such as Kagiso Ngoetjana and Nkosinathi Festile of the Mpumalanga Rhinos, Vusi Sithole and Albert Maqabe of the Free State Warriors, Sizwe Madika of Eastern Cape Windbreakers and Given Khobane of Northern Cape Zebras. The Limpopo Pride will be 1 of the teams looking to work extra hard during the offseason, they have great talent that they will look to bring closer and look to bring back Limpopo as 1 of the better provinces in local basketball. Captain Shane Marhanele and veteran Tshepo Phokwane will look to continue bringing leadership and experience that they showed through the season. While the Kwazulu Marlins had a rollercoaster season, they showed signs of great basketball, but failing to be consistent enough to put together a winning streak. Ayanda Shange will be hoping to come back sharper as his shooting was missed this season and we saw Kyle Maclean and Christian Mdletshe hold the bulk of the shooting responsibilities. The Marlins certainly look like they have the best mix of youngsters and veterans, and they will definitely hope to have a much improved 2015 campaign. The end of the Marlins’ season was also marked by the retirement of Craig Gilchrist, 1 of the greatest players to ever lace them up in South Africa. After a career which saw him play for over 2 decades, the legend has now hung his jersey up to take up another role in the game. The 2014 Semi Finals saw 2 great match-ups between the undefeated Duzi Royals and Egoli Magic, a rematch of the regular season classic which saw the Royals win by 1 point; as well as the defending champions Tshwane Suns against the relentless Soweto Panthers. The semi-finals certainly kept the fans at the edge of their seats, with the Royals and Magic going down to the wire where the Royals once again came back to win the game at the death. It was yet another heartbreaker for the Magic who lost the game by a single gasp of 74-72. The second semi was also nothing short of great; the return of the Suns captain Neo Mothiba boosted his squad in a very big way as they were able to exchange blows to the end against the Panthers. In a game which ended with scores tied at 66, we needed overtime to help decide the game and that’s were Mothiba rose above; making some clutch plays which helped the defending champs advance to the finals, finishing the game 76-71. This set up a very great final matchup between the Tshwane Suns and Duzi Royals. Before they could take to the floor though, the Magic and Panthers had a meeting to determine who will finish 3rd for the season. The game saw Joseph Mazibuko explode for 25-points, which combined very well with Captain Lesego Molebatsi’s 18 points and 11 rebounds as they guided the Magic to a 71-69 victory at the back of another good fight by Mike Mukumbuta (18 points & 10 rebounds) and Jonathan van der Bijl (15 points and 14 rebounds) for the Panthers. The final had a number of storylines; with fans waiting in anticipation to see if Duzi Royals can make it a perfect 13-0 maiden season, we also waited to see if the Tshwane Suns can own up to their title of defending champions. The biggest irony in being defending champions was that, the Suns had won their way through the season by playing great defence; which was also evident in their earlier loss to the Royals in a game that finished 57-43. It was all to play for in this game and Mothiba hoped that his availability this time around would make a favourable difference for his Suns. Tshwane jumped out to an 11-0 start which left the Royals to a shaky start which saw them score their first points with 3 minutes left in the 1st quarter. An interesting battle ensued between Mothiba and Duzi’s Corey Stern, which almost became the highlight of the game, but it was the Suns’ defense which in the end got the most praise as they went on to win the game 65-50. The Suns had won and had successfully defended their title, handing the Duzi Royals their 1st loss of the season. Tich Mabiza was named MVP for the season, which was the perfect personification for the Suns’ season which was highlighted by DEFENSE. The 2014 BNL AllStar team was then named. The team comprised of some of the season’s best performers who were going to meet up in a testimonial game against the Tshwane Suns. The AllStars named this year were;Lesego Molebatsi (Magic), Lindokuhle Sibankulu (Royals),Mike Mukumbuta (Panthers), KgomotsoLoate (Eagles), Gedeon Mulamba (Suns), Kagiso Ngoetjana (Rhinos), Stephen Gabriel (Mountaineers), Sakhile Sithole (Royals), Joseph Mazibuko (Magic), Fumani Marhanele (Pride), Jonathan van der Bijl (Panthers) and MVP TichMabiza (Suns). The game took place on Saturday and definitely gave a great exhibition for all the fans present. The much entertaining game saw the Suns lead for most of the way thanks to some great shooting by Tshepo Matsie and inside play by Mlungisi Shongwe and Somusa Mthembu. The AllStars though, came back behind Fumani, Lesego and Sakhile who were all getting some nice plays from The AssistMan Tich who was navigating the offense from the point guard position. The game went on to finish 84-78 to the All Stars, who were coached by Flosh Ngwenya and Clemen Kock on the day. This was a very great way for the Basketball National League to come to the end. We would like to take this opportunity to wish all the teams and players who will be participating in this year’s Inter-Provincial Tournament (IPT’s) well in their conquest. We would also like to wish all the regional federations good luck with the smaller leagues that will be running in different provinces and cities. In the famous words of the champions of the game, “Basketball Never Stops”. Great to hear of the success of the new revived men’s basketball league in South Africa! Where can I see the final league table for 2014 and learn more about the clubs, coaches, players and managers? And when does next year’s league start? ps How about a women’s league to follow?